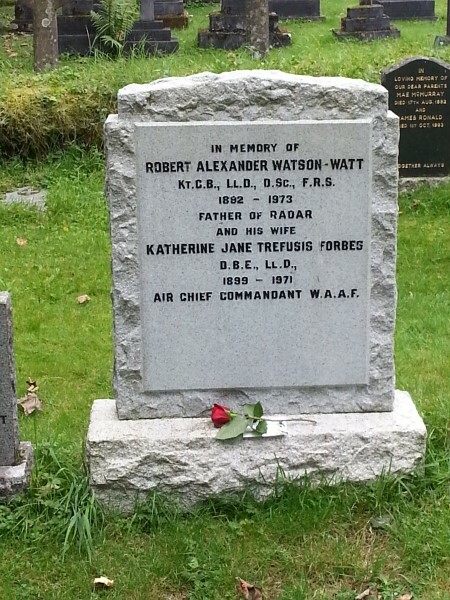 While lecturing in Dundee recently, I took the opportunity of visiting Pitlochry to pay my respects (Figure 1) to Sir Robert Watson-Watt, the inventor of RADAR recently profiled in the BBC drama ‘Castles in the Sky’. While RADAR is the invention for which Watson-Watt was subsequently knighted, the research from which it grew has also left a lasting legacy in meteorology. Using the fact that the flow of electricity released in lightning generates a radio signal, Watson-Watt and his team at the Radio Research Station (RRS) at Ditton Park near Slough (Figure 2, Figure 3) were developing techniques for tracking thunderstorms as early as the 1920s. These radio signals, known as ‘sferics’, can be heard with any pre-digital radio as cracks and pops. By detecting the time and direction at which the loudest sferics were heard, researchers from the RRS stationed at strategic locations around the UK were able to triangulate on the position of any approaching storm. This same technique still forms the basis of the UK Met Office’s Arrival Time Difference (ATD) Network which uses extremely accurate clocks to determine the position of lightning to within a few kilometres over the UK. Over the next few decades, RRS researchers developed a system which combined multiple antennae in a single unit which displayed the bearing of a storm on screen: the technique became known as Cathode Ray Direction Finding (CRDF – Figure 4). While all this was going on, a separate team lead by Edward Appleton (who was also later knighted for his contribution to UK research) was bouncing radio signals off the Earth’s ionosphere (created when X-ray and extreme ultra-violet radiation are absorbed by atmospheric gases above 100 km in the Earth’s atmosphere). 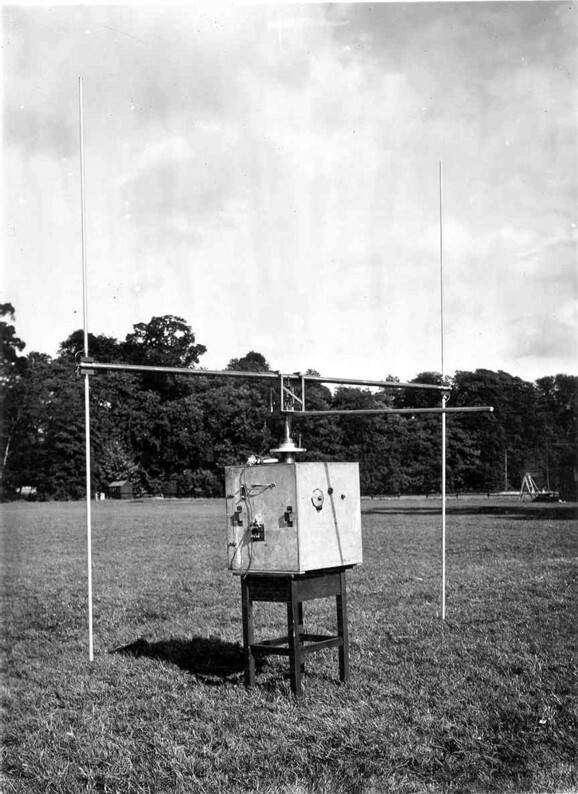 It was the combination of this ranging with the direction-finding work that inspired Watson-Watt to develop the concept of RADAR. In 1957 scientists at the RRS showed that their CRDF equipment could detect the position of the Russian Sputnik satellite, and by 1960 the organisation had been renamed the Radio and Space Research Station in recognition of this important new area of science. I owe much of my research to the work carried out by these two teams at the RRS. In 1924 Watson-Watt noted that he had observed an enhancement in the Earth’s ionosphere when thunderstorms were occurring locally. While this was of sufficient interest to be noted, he also realised that much more data were needed before this connection could be proved. Clearly the events of WWII diverted Watson-Watt’s attention from this scientific curiosity because when my colleague Chris Johnson and I investigated the same effect in 2005, no one had followed up on this comment. In 1931 Appleton had started a sequence of ionospheric measurements that continue today at the Rutherford Appleton Laboratory in Oxfordshire. Comparing these with data from the Met Office’s ATD system we were able to detect a brief but significant enhancement in the ionosphere at times when there was also nearby thunderstorm activity. Having spent many decades being developed separately, it was pleasing to reunite these two important techniques in our work. Why should thunderstorms occurring at altitudes of a few km affect the ionosphere on the edge of space? It was not until 1989 that direct evidence of what appeared to be electrical discharges above thunderstorms were observed by using sensitive cameras. These ‘sprites’ are thought to form part of the ‘global electric circuit’ providing an electrical connection between the ionosphere, weather systems and the ground. Thanks to the work of Appleton and his colleagues we know that the ionosphere is very sensitive to changes in solar activity, and our most recent research has revealed that lightning rates also appear to be modulated by particles from space. The inscription on Watson-Watt’s headstone reads ‘Father of RADAR’. While this is undoubtedly his highest profile achievement, his wider scientific legacy is still also relevant today. This entry was posted in History of Science, Space and tagged appleton, CRDF, ionosphere, lightning, radar, Watson-Watt. Bookmark the permalink.